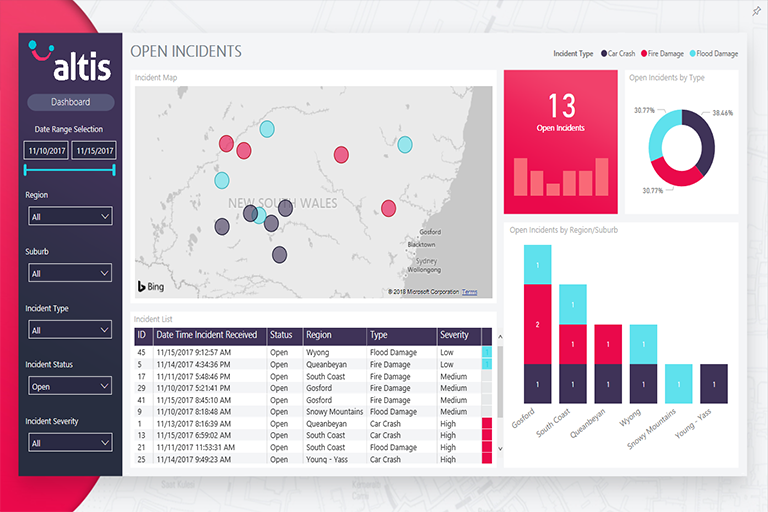 A ready-made incident analytics solution to simplify and optimise the management of incidents affecting your customers or your own organisation. In organisations around the world, whether they be an emergency and rescue management organisation, or an information technology organization: it is unavoidable that incidents and problems occur within this organisation that must be addressed and resolved in a timely manner. The speed and the efficiency at which these incidents are resolved is crucial, with slow or inefficient responses to these incidents having the potential to cause financial, productivity or reputational losses to the organisation. Through use of our incident management solution, an organisation can more effectively manage incidents within and outside of their organisation. 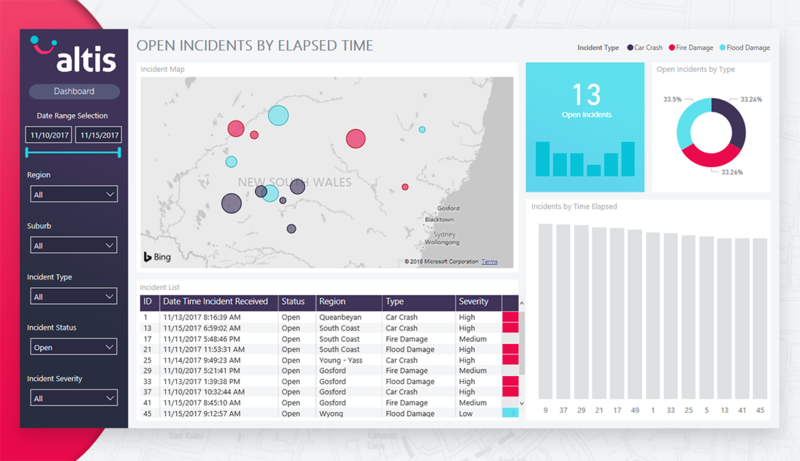 With our easy-to-use dashboards, users of all technical backgrounds can effectively interact with and monitor the occurrence of incidents across the organisation. The solution can be used to gain an insight into incidents occurring in near-real-time and identify emerging trends, to gain a spatial understanding of the location of different incidents allowing for the better management of personnel working in teams to respond to incidents, and the identification of historical trends in the occurrence of different types of incidents and the locations of these incidents. The solution may be used by emergency and rescue organisations to perform reporting and analytics on current or previous rescue incidents; power or construction organisations to help manage incidents of asset failures, faults or repair jobs. • Extensive prebuilt dashboards customizable for your needs: allowing for the monitoring of incidents occurring in real time. 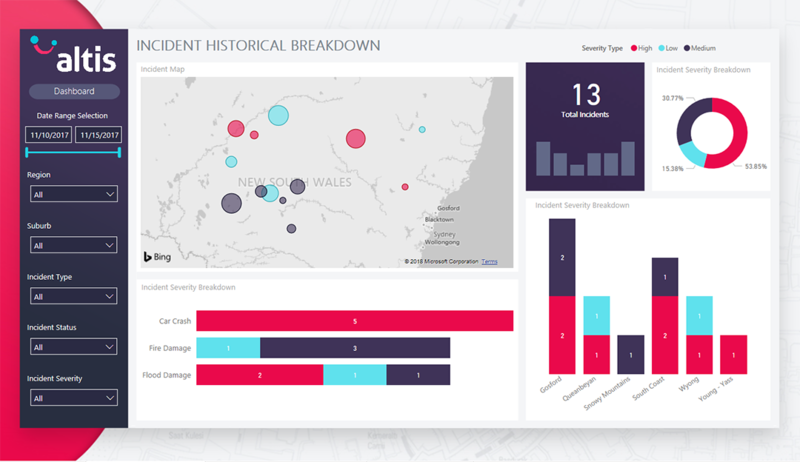 • The ability to visualize historical incident occurrences and identify incident trends; allowing for any negative trends to be quickly addressed. • The ability to filter down incidents to only those of a certain severity, type, location or a timeframe. • The ability to gain a spatial understanding of where your incidents are occurring by visualizing them on a map: better facilitating the efficient management of teams to response to these incidents. • The ability to visualize any incident metadata or any other textual data associated with an incident. 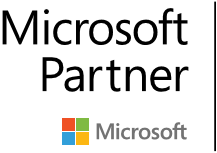 • Optimise your response in terms of teams and resources using analytics. • Respond quickly to incidents, providing excellent customer service and maintain strong relationships with your clients. • Dashboards are accessible via both desktop, tablets and mobile devices - so they can be easily accessed remotely on the go. 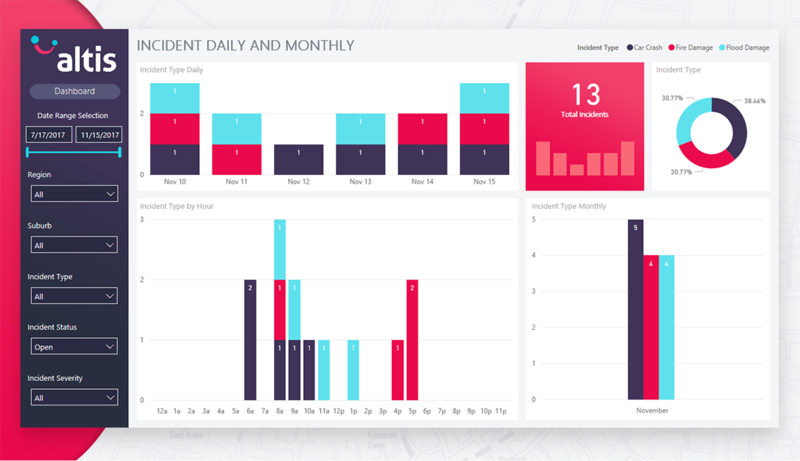 • Dashboards are customizable and can be branded or configured to meet your specific business needs.